Bee venom (apitoxin) - the secret allocated filiform gland stinging apparatus of the working bees. Bee venom contains biologically active protein (Meliton), enzymes (hyaluronidase and lecithinase A), free amino acids, histamine and other substances. Bee venom have an irritating anti-inflammatory, anticholinergic effects, reduces coagulability of blood, the quantity of cholesterin in blood, increases the hemoglobin content. 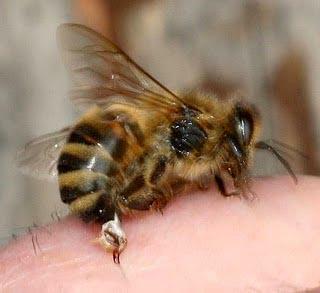 Bee venom is used in rheumatic, infectious nonspecific polyarthritis, myositis, radiculitis, neuralgia, allergic diseases (urticaria, bronchial asthma), migraines, trophic ulcers, obliterating endarteritis, physiotherapists and other Bee venom can be applied in the form of parenteral solutions, topical ointments, by electrophoresis. The most frequently used the following drugs bee venom. Venabili (Venapiolinum) - sterile oil solution of bee venom. Anapirin-1 (EC-1) contains 1 ml 2-3 conventional units bee venom, vacationin-2 (EC-2) less active. Drugs injected under the skin for 0.5-1.5 ml of the Course of treatment - 15-30 injection. Doxepin (Toxapinum) - water or oil solution of bee venom (1 ml contains 6 mg of bee venom is injected under the skin or into a muscle, from 0.2-0.3 ml and increasing the dose to 1 ml Injection doing in 2-3 places 0.2-0.3 ml in every place in a day or every day. The course of treatment is 15 to 20 injections. Doxepin you can enter by electrophoresis with the positive pole. Apizartron (Apisarthron) is produced in powder form in vials containing at 0.0001 0.001 g of dry bee venom with sodium chloride. The solution are ex tempore. External use ointments containing, in addition to bee venom, 10% methyl salicylate and 1% mustard-ethereal oil. Vorapin (Virapin) release capsules containing 0,002 grams of bee venom and novocaine and isotonic solution of sodium chloride - to 1 ml Injections intradermally in the area of the painful centre 1 time in 2-5 days, from 0.05 ml and increasing the dose of 0.25-0.5 ml of the Course of treatment is 5-10 injection. Ointment containing 0.15 mg of bee venom in 1 g, rubbing of the skin 1-2 times a day. Overdose bee venom or hypersensitivity to it can cause headaches, nausea, vomiting, rash, pain in the heart, tachycardia, increased heart rate, lower back pain, joint pain, convulsions, fainting and other products of bee venom is contraindicated in infectious diseases, tuberculosis, diseases of liver, kidneys, pancreas, diabetes, chronic diseases, blood diseases, diseases of cardiovascular system events decompensation and mental illness. Note that women (especially during menstruation and during pregnancy), children and the elderly are particularly sensitive to bee poison. Bee venom (apitoxin) - the secret allocated filiform gland stinging apparatus of the working bees. Bee venom is thick transparent liquid with a characteristic odor and a bitter, sharp taste. It quickly hardens (dry residue is 40%) and dry can survive childbirth. In aqueous solution, and also under the influence of digestive enzymes and oxidizers P. I. rapidly inactivated. P. I. contains biologically active protein melittin, the enzyme hyaluronidase and lecithinase And free amino acids, histamine (1%), nucleic acid, formic, hydrochloric acid and phosphoric acid (up to 25% of volatile acids and lost on drying), fats, steroidopodobnymi substances, volatile oils, Mg, Cu, Ca. In P. I. not found carbohydrates, Na, K, Fe. pituitary and adrenal glands; this explains its anti-inflammatory activity. P. I. has holinoliticski action reduces the clotting of blood. In the experiment P. I. makes reduce isolated smooth and striated muscles. Bee venom is used for rheumatic diseases, non-infectious polyarthritis, deforming spondyloarthrosis, neuritis, trophic ulcers, endarteriite, bronchial asthma, hypertension stage I and II and other P. I. can be applied: 1) by Ugolini bees; 2) in the form of parenteral solutions; 3) in the structure of ointments, liniments; 4) by electrophoresis. The most frequently used the following drugs P. I. Anapirin-1 (Venapiolinum-1) - sterile oil solution P. I., in 1 ml 2-3 conventional units poison. Anapirin-2 less active. Drugs injected under the skin for 0.5-1.5 ml of the Course of treatment - 15-30 injection. With venerina similar doxepin (Toxapinum); it is injected under the skin or into a muscle, from 0.2-0.3 ml and increasing the dose to 1 ml Produced in Czechoslovakia, virapen (Virapin) release capsules containing 0,002 grams of apitoxin and novocaine and isotonic solution of sodium chloride - to 1 ml Solution is injected intradermally 0.05-0,5 ml of a Similar product - apizartron (Apisarthron) - released in the GDR. The vials contain drug at 0.0001 0.001 g of dry P. I. Virapen and apizartron release Also in the form of ointments. When idiosyncrasy to bee poison, or it overdose may experience headaches, nausea, vomiting, hives, asthma phenomenon, low blood pressure, fever, polycythemia, hemolysis. P. I. contraindicated in idiosyncrasy to him, infectious diseases, tuberculosis, diseases of liver, kidneys, pancreas, chronic diseases, blood diseases, diseases of cardiovascular system events decompensation.